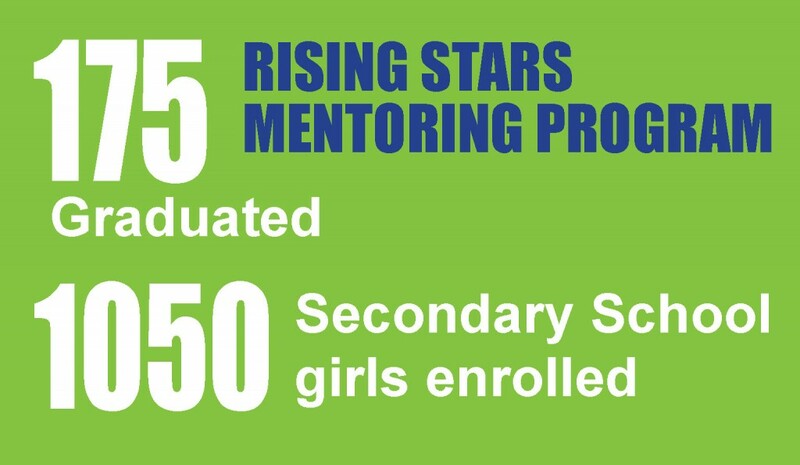 Launched in 2011 by the American Ambassador to Uganda, Jerry Lanier, the Rising Stars Mentoring Program is a young women’s empowerment initiative that inspires and equips them with leadership, employment, vocational, entrepreneurship and social/life skills. The project goal is to empower young women in secondary schools in Uganda by strengthening their ability to become active players in transforming their lives and prepare them to confidently and competitively enter the job market as employees or employers. Equipping young women with 21st century skills ignites their cognitive, critical thinking, innovation and inter-dependence, communication, creativity, leadership and financial literacy which are critical necessities for success in the global economy. These skills enhance young women’s potential to excel in life and work through proper career planning, skills development and connect them to real work experience while still at school. The relevance of learning in secondary school is important given that this is the level from which many youth enter the labour force. Parents, community leaders and teachers are trained as support mentors so that they integrate the skills into the existing life style, structures and activities. The program focuses on girls’ access to quality education, school retention and transition from secondary schools to university and into adulthood. Currently funded by MacArthur Foundation under the PSIPSE program, Rising Stars Mentoring Program is impacting 1050 girls in 7 secondary schools in post-conflict regions of northern and western Uganda including: Pope Paul VI-Anaka, Secret Hearts Secondary School, Lawagi SeeD-Pader, Everest Girls’ Secondary School–Oyam, Kyenjojo Secondary School, Bujubili Vocational School-Kyaka II and Rwamwanja Settlement School. The innovative model, the 5D CYCLE® enables girls to Discover who they are, Dream about what they want to become, Design ways of achieving those dreams and Develop key skills and habits that will lead them to rewarding Destinies. Through mentorship, value-based leadership, life skills and livelihood skills development, the practical and experiential learning tools enable girls to ignite their inner potential, increase the young women’s employability and job creation skills, have access to positive role models, start their own enterprises and get internship opportunities. The public speaking and debating competitions, poetry and art stimulate the art of self-expression and self-confidence. Each Mentoring Club does a community dialogue and initiative by engaging community members to identify, design and implement solutions for specific challenges like early marriages, sexual exploitation, and water and sanitation.